The Portable Skittle Alley Company is part of Midland Games Ltd, a well established leisure hire company based in Dudley, West Midlands. As well as skittle alleys we hire out various innovative games and games packages. Games for hire include pub games, giant operation, giant inflatable dart boards, air racer challenge, giant buzz wires, traditional dart boards, table tennis and beat the bleep. For further details and to view our full range of games please visit www.midlandgames.co.uk. Our company was formed in 1999 to meet the increasing demand for traditional portable skittle alleys, which we offer for hire throughout the United Kingdom. The game of skittles is thought to have originated in Germany and is usually played with nine skittles and three bowling balls. The game of skittles is played in a similar way to 10 pin bowling in that the objective is to knock down as many skittles as possible. 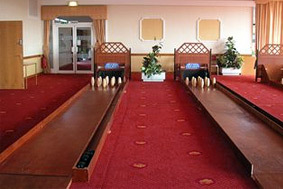 Skittles is normally played in teams but can also be played individually. As skittle alley hirer’s, our company has been able to develope skittle alleys which are light, compact and adjustable so that they can fit into most venues and be assembled within 10/15 minutes. Skittle alley hire can be enjoyed by all ages and abilities and the game can be delivered to most venues including hotels, clubs, pubs, leisure centres, community centres, schools, village halls and company offices. Our company’s aim is to make it as simple and as straightforward as possible to hire a portable skittle alley. 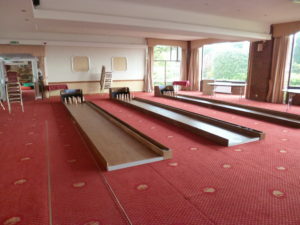 Our skittles hire service includes delivery, set up and collection and we can supply one or more skittle alleys depending upon the numbers bowling, and the space and time available. We provide skittle alley hire for corporate events, schools, weddings, golf clubs, birthday parties, anniversaries, charities, conferences, sports clubs, church social events, clubs, pubs and hotels. For free quotations please complete the enquiry form on the Contact Us page.